LIMESTONE MOLD LS 1111/2 Rubber molds have the abrasion resistance and tear strength needed to keep production moving. Casting concrete into rubber molds lets you make perfect copies of any original every time! Concrete Stone Molds are ready for casting same day and last in production...saving you time, labor, and material costs. Urethane molds are used everyday by professionals to make architectural elements, concrete stone veneer, formliners, concrete countertops, GFRC panels, concrete statues and furniture and the list goes on. These molds can be used over and over. You are purchasing 6 section urethane rubber mold designed for casting plaster, concrete and polymer concrete. The Concrete Stone Mold size 3.23 SQ.FT(0.30m2). approximate, measurements are24.5" X 19" X 1.5" inch (62cm X 48cm X 4cm). Approx. size of each section 10.7" X 6" x 1" (30cm X 15 cm X 2.5cm ). These concrete stone molds are easy to use, and each purchase comes with an instruction sheet with information and tips on: mixing and pouring concrete, coloring the stone, releasing the casting. Please note: The stone making instruction will be sent to buyer's email address by request. The stone making instruction also available on GlobMarble web site. 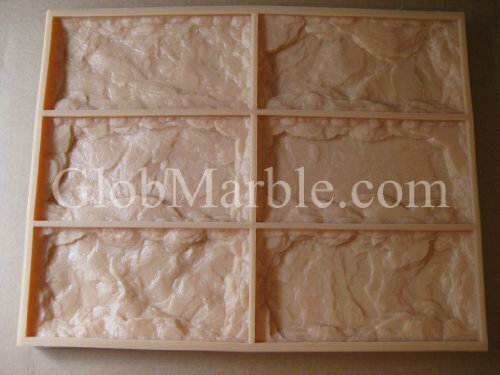 Wholesale orders available at: http://globmarble.com/online-store/en/concrete-stone.html?sef_rewrite=1 We manufacture all of our own products and have an unlimited supply. If you need more, let us know, we will get right back to you with pricing. If you'll order more than 1 product, post charges will be combined automatically by Amazon shipping calculator. If you have any questions about this product by GlobMarble, contact us by completing and submitting the form below. If you are looking for a specif part number, please include it with your message.